Social Networks are Like Chips ‘n Dip: Take a Thought, Post it Once, and Move On! No Double-Dipping! It’s ridiculous out there. Seriously. MySpace used to be all you need. Yes, it was horrible, and the HTML editing allowed for the most atrocious setups, but at least everything was contained in one area. Now, we have many options. Facebook and Twitter, while not being the only choices, are certainly the two top contenders. Then, just two weeks ago, Google had to go and muck it all up by getting into the game (again, after not doing so well their first two times). Now, we have three top contenders, since Google isn’t going anywhere (and, frankly, I think Google+ may end up being the better product). Add to that other services we use to manage and share our digital lives — Flickr, Delicious, Picasa, Diigo, and more. How do you wrangle all of these? Well, you have some options. It’s not the most automated way, but you can get the job done with no setup or cross-accounting (covered below). Have mostly family on Facebook? Put your family-oriented updates there. Have mostly work friends on Google+? Put your work related posts there. Have your PLC on Twitter? Then post your links and network-bragging thoughts there. Again, not the most streamlined solution, but it does keep your different networks separate. I know this doesn’t seem revolutionary, or even worth mentioning, but I do this to help keep you sane: if you’re going to keep your networks separate, then keep your posts separate. Don’t double post the same link or comment! Think to yourself, “Does my family care about the newest Jailbreak release for iOS 4.3?” If not, then just drop it on Twitter, and be done with it! Likewise, “Do the people in my Twitter PLC care about what I’m BBQing this weekend?” If not, then post your awesome grilling techniques on Facebook, and save your 1k acquaintances the trouble of sifting through it. This is a feature not many are aware of, but exists in most services. Do you currently find yourself jumping between Facebook and Twitter? Found a link you know your PLC and your family/friends would love to see? Then no need to post more than once. Both Facebook and Twitter offer cross-account updates. Chrome Extension – I don’t use Chrome (FF4Life), but there is an extension out there that will connect your Facebook and Twitter accounts to Google+. What this means is when you post to your Google+, it automatically gets pushed to your Facebook and Twitter accounts. This depends on what services you use, but hopefully this will inspire you to be creative in how you decide to link all of your services to make life as simple as possible. Again, the GOAL is to only post ONCE! Here’s what I do (again, just an idea of how 6 services can all feed each other). Now, the challenge is how to link them all. You’ll want to start with the service you POST to the most. Keep in mind, this is just for posting. You’ll still need to open Facebook, Twitter, and Google+ in order to see everyone’s posts. What we’re doing is trying to cut down on the time YOU spend posting the same link/comment. Gave WordPress access to post my Tweets (as you can see, I don’t get to update this blog as much as I’d like, but all of my Tweets are posted to the site automatically, so you can at least see what I’ve found between blog posts). So, ONE update feeds into THREE networks and this blog. I use Google Reader to access all my sites. I use Delicious to track all of my links. So, when I come across a good link in Google Reader, I hit my Delicious Bookmark Button (via the Firefox Add-On), and the screen pops up to let me save the link to my bookmarks. So, I just saved a link for later, and also fed it out to THREE networks all with ONE click. This is simpler than the other two, because I only share my Flickr photos with Facebook. I set Flickr up to automatically dump my photos into Facebook. But, I know not everyone uses Flickr. Some people use Facebook to store/share their photos. 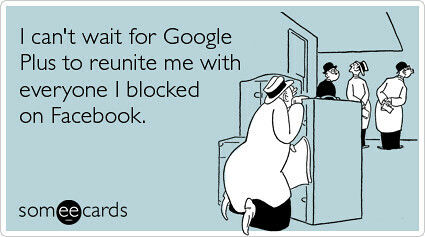 No worries, you can also setup Google+ to pull in all of your Facebook pictures, as well. Obviously, your setup is different than mine. I don’t mind cross-sharing between Facebook, Twitter, and Goolge+. I know a lot of users like to keep work, friends, and family separate; however, in my life, my work, friends, and family are usually the same people. Hopefully this gave you an idea of how you can make complicated technology, that was originally intended to make your life easier, actually easy to keep up with. Have anything to add? Other methods you use? Just drop it in the comments below.